People who use Wheel Chairs , always face difficulty using escalators. Students at Illinois Institute of technology find solution of this problem by designing this chair in different way. Wheel Chair developed by them can be used at escalators. 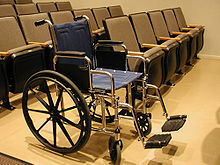 Building wheel chair requires good design, it should be robust and light weight. Their is very little scope of error because it is going to be used on escalators where even a minor mistake put its rider at risk. In the video given below, you can see how student of Illinois University has implemented this project successfully. It is designed in such a way that when it is used on escalators it becomes immovable and stable. For that purpose it has support in the front which gets grounded when required. Im interested in this project. Maybe i can try for my final year project. can I get further details about this project.